On behalf my delegation and that of my own, let me express my profound appreciation for the Government and the Republic of Philippines for hosting this meeting and according us a very warm hospitality since our arrival. I am also grateful for the UNDP and other partners for their continued support of the Forum. As the first African country to chair this Forum I am honored and delighted to officially accept the Chairmanship of the Climate Vulnerable Forum, a Forum that represents 1 billion of the world population and quarter of members of UNFCCC parties. I would like to express my profound gratitude for the entire membership of the Forum for your trust and confidence. Let me assure you the full commitment determination and readiness of the Ethiopian Government to advance the collective interests of the Forum. We count on the continued support and cooperation of all members during our presidency. Climate change poses an urgent threat to all peoples around the world, however, we cannot hide the glaring fact that climate change does not affect all countries equally. Countries with the least contribution to the Green House Gas emissions are often affected the most. For us, the most vulnerable countries, the issues of climate change are a matter of survival. No matter how hard we strive to develop our economy we continue to be faced with serious, devastating and unforeseeable challenges that impact our endeavors to achieve inclusive and sustainable development. In a changing climate, our unity must stand strong and firm to develop in a way that meets our needs at present without compromising the ability of future generations to meet their own needs. We shouldn’t be pointing fingers at each other, rather we need to cooperate because climate change is a problem that no single country can tackle on its own. Our contribution to the existing threat might be insignificant but we do not sit idle. This is why Ethiopia, for example, communicated an ambitious contribution, of NDC, towards the international effort to reduce our emissions by 64 percent by 2030 using 2010 as the base year. Ethiopia is also committed to becoming a low carbon by 2030 and a middle income country by 2025 –we see that as the fastest path towards enhanced prosperity. This Strategy has been integrated with the Growth and Transformation Plan of the country. It gives me a great honor to chair a group that is committed to a carbon neutral economy. This Forum has brought together countries that are willing not only to talk the talk but also walk the walk. It would be remiss if I don’t acknowledge the Forum’s contribution to the success of the Paris conference on climate change last year. It is the members of this Group that were the first to sign this historic deal. Although Paris was a huge success for our planet, it is not an end in itself and we should work together for its implementation. Solidarity must be demonstrated again in the process of ratification and after entry into force to accelerate the implementation of the agreement. It is my conviction that this Forum will continue to serve as the vocal and visible coalition to influence others to be committed to the Paris Agreement, the implementation of which is a requirement for our very survival and safety. As the chair of this Forum, the Government of the Federal Democratic Republic of Ethiopia will give focus and priority, among others, to the following issues. We intended to continue and strengthen the activities started by Philippines and previous members to follow through and ensure no falling behind or “back-sliding”. 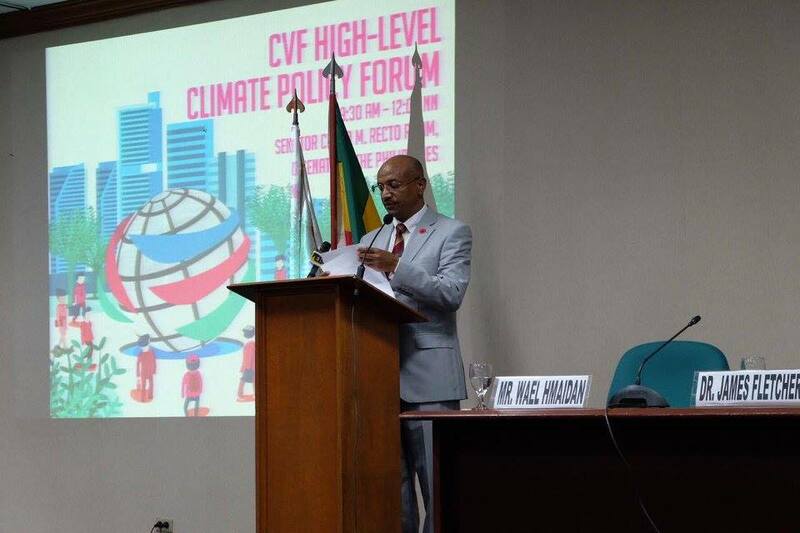 We will also work to enhance the work of the CVF on climate diplomacy, leadership, negotiations, and communication. This Forum, as it has been doing in the past, should be purpose-driven and result-oriented. We can also look to strengthen the impact as well: Member states could deliver concrete outcomes for their vulnerable populations. This might include setting a system to measure the results accomplished so we can highlight our achievements and promote robust follow-up. Once again, I would like to invite you to join me in thanking the Government of Philippines for their great leadership of the Forum. We would like to congratulate and express our highest appreciation for the able leadership of Philippines in chairing the Climate Vulnerable Forum. It is with the remarkable leadership of the Philippines that we managed to have 1.5 degrees in the Paris agreement. That one vital number marks the difference between struggle and survival, between life and death, between hardship and prosperity. Your leadership has guided the forum not only to have a comprehensive analysis of the Paris Outcomes but your contribution has also helped billions of people in other countries to join hands for the common good of this planet. We are also graced today with the presence of the Forum’s founder, the Republic of the Maldives, with my honorable and distinguished colleague, His Excellency, Minister Majeed. Your consistent commitment to the cause of the vulnerable countries through this Forum and your coordination of AOSIS are an example for us all. Allow me to also acknowledge the members of the CVF Troika, Bangladesh and Costa Rica. Thanks to all your efforts any future leadership of the Forum has a hard act to follow. These are big shoes to fill. But we are grateful to have been reassured that we will have your and the past chairs guidance during our presidency. Let me assure you of the readiness of the Ethiopian government to serve the interest of the forum in close collaboration with all of you. We will be so happy to host you in Addis by the end of October where we would set our priorities for the COP 22. We also wish to build on the discussions of this seminar to set our milestones for the Forum. As we fill the role of the CVF presidency we will like to express not only our support but also our commitment to the Kingdom of Morocco to produce a successful outcome. Finally, we are delighted to recognize the support that has been provided by our partners for the cooperation efforts of our members, in particular Germany. In that respect, I am pleased to inform this assembly of the request for funding submitted on behalf of the CVF leadership to the International Climate Initiative of the German Federal government. We are in no doubt that this proposal of great significance to our group will receive favorable consideration. It can do much to further our collaboration and impact in support of the Ethiopia-Philippine-Costa Rica Troika and all our nations in these global efforts. Together, in solidarity, fighting for our people, I am certain, we will prevail.